Miniature Folded Package Insert - Flottman Company. Include all relevant and required information about an eye drops product with the packaging without taking up extensive room. Fourteen-panel folded product insert that includes all necessary information but folds into a manageable size. Our customer was able to save money by using a miniature folded piece that didn’t take up much room in the packaging. This miniature folded informational sheet was created to include in the packaging for eye drops. The fourteen-panel sheet offers additional information on the company and the product. It defines dry eye so consumers have a full understanding of what they are treating with this product. It also includes the details of their money back guaranteed offer. This insert allowed our customer to include relevant information that would not have otherwise fit on or in their packaging. By creating an insert that can be folded into a small, convenient size, consumers have access to all of the information they need in an unobtrusive way. The insert was designed so that the logo and brand colors are on the outside of the piece when it is folded. When you undo the first fold, you can see the header and a glimpse at the information that is included. By including the bright brand colors on its exterior, the insert catches the eye of consumers, encouraging them to open the sheet. The design and fold pattern work together to create a piece that is organized and intentional. 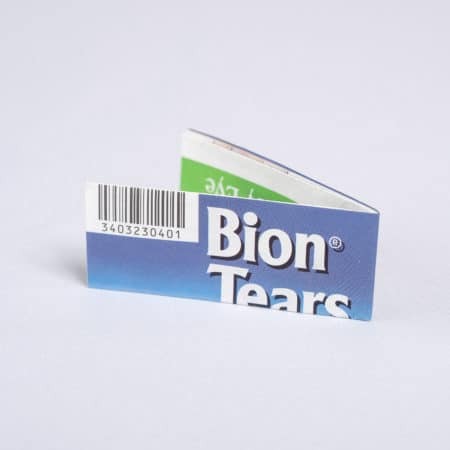 By adding their additional information to a product insert, Bion Tears was able to inform their consumers without creating an unnecessarily bulky package. Miniature folding is the perfect solution for fitting additional information in your packaging. These pieces end up in your consumers’ hands without them putting in any additional effort. How can miniature folding help your products and projects shine? Request a quote today!